As a parent, you will usually notice speech problems when trying to communicate with your child. When your child responds, you may have difficulty understanding what they are trying to convey.Symptoms such as, stuttering, mispronunciation of words, slurred speech or inability to speak are all part of speech delays. Often speech and language are thought to be the same however there is a difference between the two. Speech refers to the actual process of making sounds, using such organs and structures as the lungs, vocal cords, mouth, tongue, teeth. For example, a child may be delayed in speech (i.e., unable to produce intelligible speech sounds), but not delayed in language. In this case, the child would be attempting to produce an age appropriate amount of language, but that language would be difficult or impossible to understand. Language is commonly divided into the following two categories. Receptive language refers to the process of understanding what is said to the subject. Expressive language refers to the use of words and sentences to communicate messages to others. Both categories are essential to effective communication. However a child with a language delay typically has not yet been able to use language to formulate material to speak; therefore they are likely to have a delay in speech as well. The warning signs of early speech delay are categorized into age related milestones, beginning at the age of 12 months and continuing through early adolescence. Studies show that children diagnosed with speech delay are more likely to present with behavioural and social emotional problems both in childhood and as adults. Decreased receptive language, reading, and learning skills are common side effects for children that suffer from a speech delay and do not receive adequate intervention. 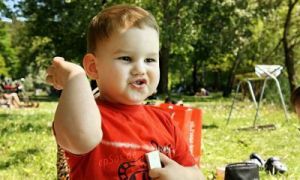 Similar studies suggest that children with speech delays are more likely to have a difficult time communicating and bonding with peers, which could have negative effects on their psychosocial health later in life. Tongue development - Sometimes problems with the developments with the tongue or palate (the roof of the mouth) can cause delayed speech. Oral-motor problems - This could be due to inefficient communication in the areas of the brain responsible for speech production. This could cause problems processing and outputting speech. Therefore the child will have trouble using the mouth to produce sounds and hence causing talk delay. Hearing - Your child could have trouble hearing. Just pay attention and see if your child responds to your sounds. If in doubt, it will be advisable to check with an audiologist. You as a parent, play a vital part of your child’s speech development. A lot depends on the environment at home or at childcare. Make sure that you engage your child in conversation so they can gradually develop by your means of communication. You can start communicating even during infancy. You can talk, read, imitate sounds and gestures and even sing. You can even use your everyday situations so you can talk through the day. You can engage in a conversation while you are cooking, driving, in a mall or even while cleaning a room. The options are limitless. Simply point out to the objects during your conversation so your child can understand and gradually develop. Use simple language when you talk to your child and ask him a lot of questions. This will reinforce your child’s speech development as well as language development. Engage in some activities and play with your child. There are a lot of educational activities you can do with your child. Reading is also another important factor. You can read age appropriate picture books to your child starting as early as 6 months. Kids love looking at the pictures while listening to you. Gradually they tend to remember the easy words and as a matter of time they even start to remember the whole story. During this process, your child will also try to imitate the sounds and even try to name some. This is the first stage of the speech development. Respond to your child's speech to give him positive reinforcement when he does talk. You can even repeat and expand on what your child says by turning the single words into longer sentences. Most important of all, start contributing to your child’s development from the early stages itself. This is the best approach to help your child language development and speech development. If you have any concerns or issues regarding your child's early speech and language development, as well as other developmental concerns, discuss them with your doctor. It can be difficult to determine whether a child is just immature in their development or has a problem that requires professional attention. See Child Development page to know more about the Speech and Language Development Milestones achieved during various stages of development. Knowing the developmental milestones can help you figure out if you should be concerned or if your child is right on schedule. After reading the above, you should now have an idea about your child’s speech development stage. If you still think that your child exhibits symptoms of speech delay, then please do see your Doctor. If required, they may refer you to a speech-language pathologist who will look at your child’s speech development. If you choose to observe your child’s development a bit more, it would still be a good idea to address this to your doctor during one of your visits because some doctors advise against ‘wait and see’ option that some parents take. If there is a serious complication, it is better to be diagnosed at the early stages.